Showing results for tags 'Health communication'. 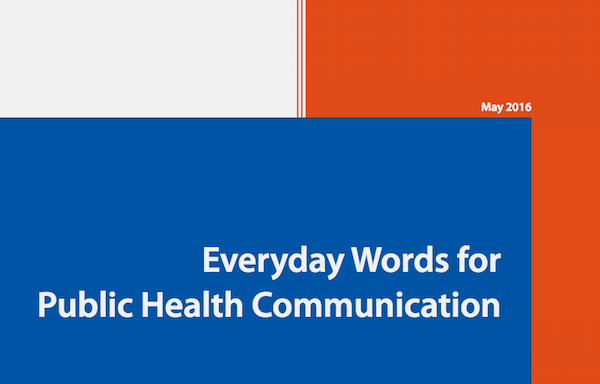 This document lists frequently used terms in public health materials and their common, everyday alternatives in plain language sentences. Original sentence examples come from materials on CDC.gov. Some words and phrases may have multiple meanings, so check the context of use before you substitute. Remember, it might not be enough to delete jargon and substitute an everyday word in materials for the nonexpert public. You may have to rewrite the entire sentence or sentences and use multiple techniques. As a rule, you help readers when you: • Write short sentences. •Use active voice. •Use everyday words and pronouns (when appropriate). Who should use this document? Anyone writing for an audience that will benefit from jargon-free language: Consider the intended audience, and use the language that will make the most sense to them. When you do need to reach a broad, public audience without specialized knowledge about a topic, everyday words are the most appropriate language to help the most people understand the information. This is a 36 page module from the healthcare workers training. 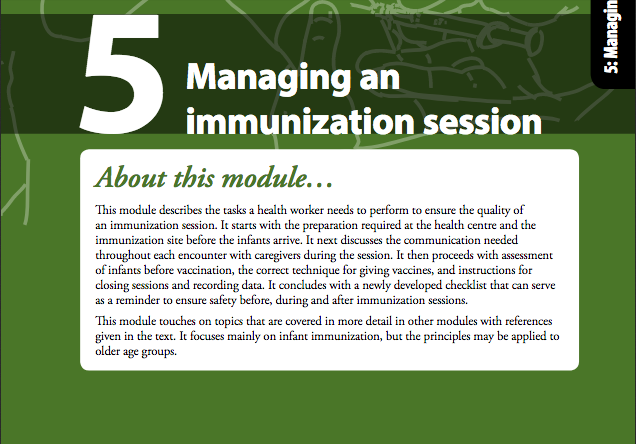 This module describes the tasks a health worker needs to perform to ensure the quality of an immunization session. It starts with the preparation required at the health centre and the immunization site before the infants arrive. It next discusses the communication needed throughout each encounter with caregivers during the session. It then proceeds with assessment of infants before vaccination, the correct technique for giving vaccines, and instructions for closing sessions and recording data. It concludes with a newly developed checklist that can serve as a reminder to ensure safety before, during and after immunization sessions. This module touches on topics that are covered in more detail in other modules with references given in the text. It focuses mainly on infant immunization, but the principles may be applied to older age groups.